This generally common and widely distributed species is also a minor pest of cereals. The adults (9-10mm long) (Fig. 334) are mainly black, with the apex of each femora and the base of each tibia reddish. They occur from late April or early May onwards and may often be seen flying around the periphery of cereal fields. The larvae feed on the foliage of cereals during the summer months and, eventually, pupate in the soil. There is one generation each year. Fig. 335 Young larva of apple sawfly, Hoplocampa testudinea (x20): (a) tip of abdomen (further enlarged). about 2-3 weeks, the larva vacates the original fruitlet and invades an adjacent one, usually entering directly through the skin on the basal half; further fruitlets may be attacked before larvae are fully grown and drop to the ground. Larvae overwinter in the soil in silken cocoons, formed several centimetres (and often as deep as 25 cm) below the surface. Pupation occurs in the spring, a few weeks before the emergence of the adults; some larvae, however, may remain in the soil for one or more seasons before attaining the adult stage. Adult 6-7 mm long, shiny black dorsally and orange ventrally; wings more or less clear, with brown veins. Egg 0.8 mm long, white and translucent, elongated and slightly curved. Larva up to 12 mm long; body whitish; head yellowish-brown; abdominal prolegs seven pairs present; caudal plates (on abdominal segments 8-10) inconspicuous. 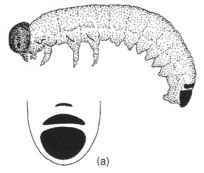 Young larva whitish; caudal plates on abdominal segments 9 and 10 very conspicuous (Fig. 335) but the plate on abdominal segment 8 small and inconspicuous (Fig. 335a); head blackish.